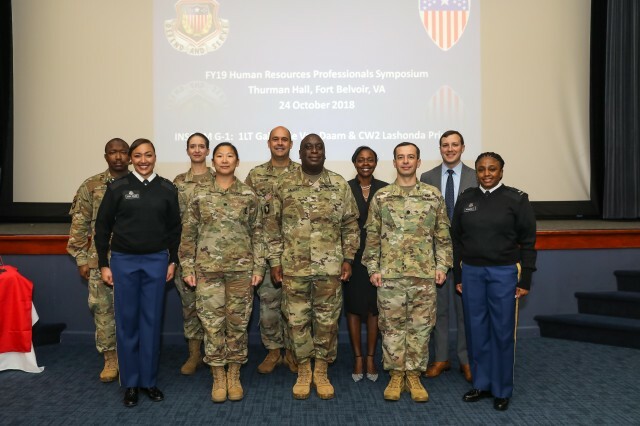 FORT BELVOIR, Va. -- Members of the U.S. Army Intelligence and Security Command (INSCOM) Office of the Assistant Chief of Staff, G-1, hosted the first of its kind Human Resources (HR) Professionals Symposium for members of the U.S. Army Adjutant General's (AG) Corps and HR community at Thurman Hall, Oct. 24. Created and driven by 1st Lt. Gabrielle Van Daam, INSCOM G-1 deputy chief plans and operations, and Chief Warrant Officer 2 Lashonda Pringle, INSCOM human resource technician, the symposium is designed to provide in-depth technical knowledge and professional development briefings for S-1 personnel from the battalion up to division-level, and foster a community of HR professionals in the area. 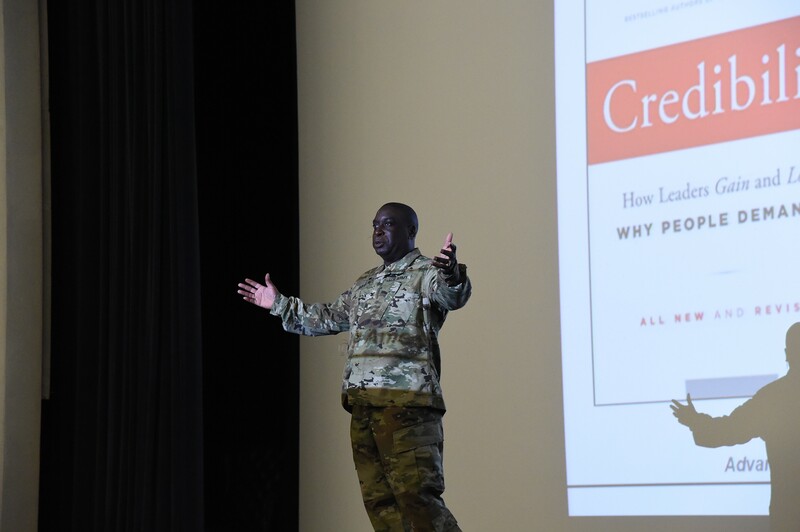 To that end, the symposium brought in HR professionals from both active duty and reserve components of the U.S. Army to provide different perspectives and experiences. Col. Addalyrica George, INSCOM assistant chief of staff, G-1, used the unique opportunity of the symposium to enable HR professionals to hear new ideas, as well as, proven best practices and increase knowledge. "It was the spark needed to reignite the HR Community in INSCOM and the U.S. Army," said George. For Pringle, the symposium is a necessary step in the professional development process. "This symposium is just a small stepping stone in keeping the AG Corps trained and mission ready," she said. "In order to do my job better and more efficiently, I expect my AG and HR seniors, peers, and subordinates to remain educated on the multitude of HR correspondence we must adhere to in order to collectively thrive as a team." The symposium was highlighted by keynote speaker Col. Marion Salters, executive officer to the Assistant Secretary of the Army (Manpower and Reserve Affairs), who stressed the importance of technical expertise in order to build credibility within each unit. Salters routinely asked the audience regulatory questions and shared his leadership tenets, while always returning to the importance of having credibility with your commander. "HR professionals have to be a credible source," Salters affirmed. "If you are going to advise your commanders or command sergeants major or whomever, you need to know what you are talking about." Mentoring the assembled crowd, Salters discussed how to provide effective advice to a commander. "You don't make decisions," he reminded the audience. "Use your leadership skills to influence the people that can affect them. Tell the commanders, here is what I recommend to you, and then there are ways to shape those outcomes." 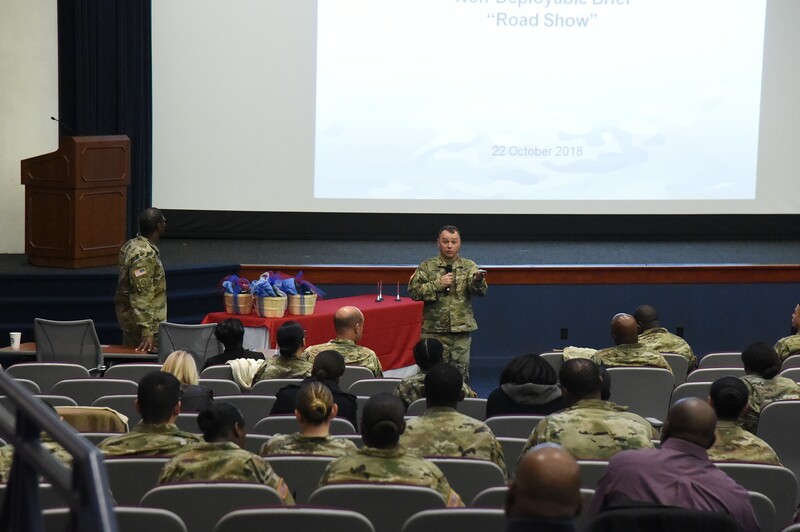 The symposium also highlighted personal and professional development opportunities including, briefings on the Adjutant General's Corp Regimental Association (AGCRA) Potomac Chapter, human resources certifications for both military and civilian service and enlisted and officer evaluations and promotions. The AGCRA's mission is to sponsor new HR methods, improve techniques, developments, and other innovations designed to increase the efficiency of the United States Army, and promote esprit de corps throughout the HR community. 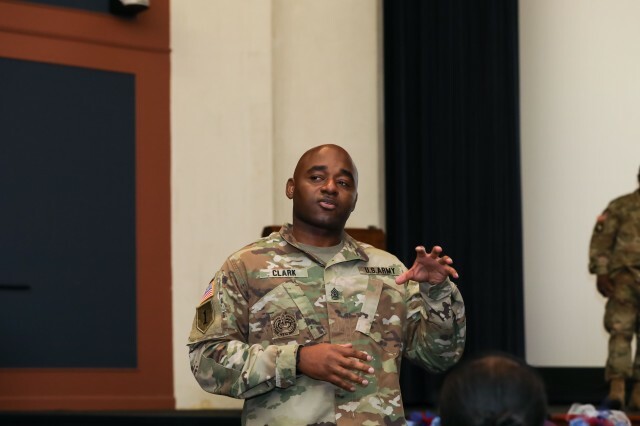 The session that drew the most interest, however, was a briefing on readiness, which included a discussion on U.S. Army policy regarding non-deployable Soldiers. This discussion, a highlight of the event, contributed a greater understanding of how the U.S. Army is utilizing the data provided from the company level all the way up to the Pentagon to inform policy and reduce the number of non-deployable Soldiers across the U.S. Army. George was pleased with the scope, discussion and professional benefits of the symposium. "The symposium fostered cohesion and esprit de corps within the INSCOM and Army HR cohort and will improve the HR support necessary to keep Soldiers ready to deploy, fight, and win decisively against any adversary whether in a strategic deployment from the United States or an operational deployment within a theater," she said. Going forward, the impacts from the symposium will directly benefit INSCOM and its major subordinate commands' readiness according to Van Daam. "Readiness is at the forefront of the Army's initiative, and ensuring our HR professionals are abreast to all standards and requirements is imperative to mission success" said Van Daam. "This symposium offers a unique opportunity for Soldiers and civilians to receive guidance and pertinent information directly from pinnacle sources, like HRC and the Pentagon." For more than 220 years, the mission of the AG Corps has remained constant: to assist the commander in war and peace, and to provide superior personnel support to the Soldiers, civilians and families which make up the Army. With a motto of "Defend and Serve," the AG Corps has the prestigious distinction of being the second oldest profession in the U.S. Army. This semi-annual symposium will continue to help the AG Corps master their craft, increase readiness and improve technical expertise long into the future. "As said by General Milley, 'readiness today equals readiness tomorrow,' added Van Daam. "INSCOM will now be equipped with the knowledge to prioritize all efforts in order to continue meeting the Army's standards."